As regular followers will know I am a big fan of cryptocurrencies that pay dividends, so recently took a look at the Global REIT ICO, which is aiming to combine property investment with the blockchain. This is an interesting project as it is aiming to pay a regular monthly dividend at an equivalent rate of 8% per annum and it is based on real-world assets rather than some of the more speculative cryptos that aim to pay dividends but haven’t yet delivered (some of which I am sadly invested in). So I thought it would be worth delving a little deeper into what Global REIThave planned and where they are going with their Roadmap. But first, let’s just have a quick recap of what the project is all about. REIT stands for Real Estate Investment Trust and they are traditional financial instruments that allow investors the opportunity to invest in real estate without needing to actually lay out hundreds of thousands of dollars on buying a property or land and having to put up with the hassle of managing it. Instead, you can buy shares in a REIT, which is a company that will buy and manage properties on investors’ behalf, bringing together millions or even billions dollars of funds together to do so. Investors then receive dividend income from the rent, interest payments and capital profits the REIT accumulates. Public Storage (PSA) — listed on the New York Stock Exchange, invests in storage facilities (as the name suggests!). Market Cap: $37bn. Equity Residential (EQR) — listed on the New York Stock Exchange, invests in multifamily properties. Market Cap: $25bn. Health Care REIT (WELL) — listed on the New York Stock Exchange, invests in nursing homes and healthcare facilities. Market Cap: $22bn. Global REIT (Global Real Estate Investment Trust) will seek to integrate this classical REIT model with the blockchain. They will purchase a range of property assets including hotels, residential homes, and shopping malls financed by the ICO. The benefits of Global REIT as opposed to a traditional REIT will be that they will offer token holders access to assets including free stays at Hospitality Assets such as hotels; there will be reward points which you can exchange for services; you can receive a share of the fund management income — and there will be monthly rather than the quarterly dividends normally received with REITs. OK so that’s what Global REIT is all about and what its benefits are, but what about the roadmap? What are their plans going forward? The blockchain technology for the platform has already been developed and was completed in February of this year, with the concept having been created late last year. 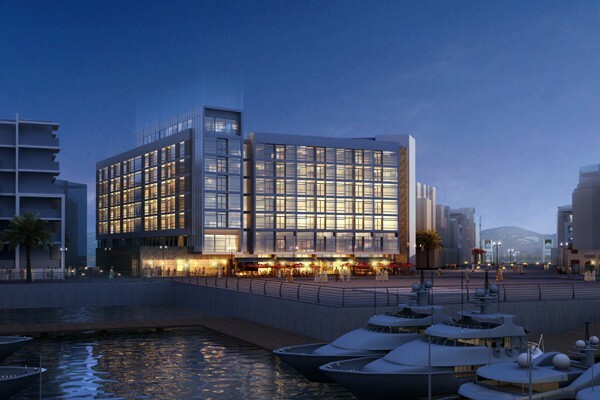 They are already planning to purchase their first asset, which will be the Mysk Hotel by Shaza in Dubai, valued at $75m, pictured below. The hotel is along the world-famous Palm Jumeirah and is just 20 minutes from Dubai international airport. They are aiming to start with an average annual occupancy rate of 75% in the first year, reaching 85% per year within two years. They are anticipating room rates to average around $300 per night by the second year, thus providing very decent income from this first asset under management (AUM). Resulting from all this, they expect the first asset will be secured on an 8% yield locked in for 5 years. Global REIT aim for the first dividend distribution to be made as early as July, so just after the ICO has been completed. This would be a great boost for investors if they are able to keep to this timetable. December 2018: Purchase of the second hotel, which will be in the UK. So by the end of this year they should have four assets under management in a variety of different property classes. Following these initial planned purchases, they plan to diversify the portfolio to derisk it as much as possible in terms of global economic conditions. They plan to purchase a range of different property types including hotels, shopping malls, residential and commercial properties, hospitals and warehouses in a variety of different locations. Global REIT will appoint an Independent Investment Committee to evaluate potential assets they could purchase, whilst keeping in mind the overall objective to maximise returns for investors. So those are the plans for Global REIT as far as they are spelled out in the White Paper and on the website. It is good to see that they already have a series of targets identified and are ready to start rolling out dividends already next month. REITs are well-established investment vehicles with many operating successfully around the world, so this is a tried-and-tested investment method. Whether Global REIT can execute successfully remains to be seen, but they have some ambitious plans in place and there is certainly something to be said for investing in concrete assets like property rather than the more intangible things that are sometimes involved in cryptocurrency projects. You can check out the Global Reit ICO here, join them on Telegram here and follow their announcements on bitcointalk here.